In the many years I have given and received valentines, there remains one gift that will forever come to mind on this auspicious occasion. It was my freshman year at college. I’m not going to tell you how many years ago, but suffice to say it was a few years ago. A girl I was dating at the time and I planned to spend Valentines Day by going to the fraternity I was pledging. That in itself is a story. I firmly believe that the classic film, Animal House, was modeled after Delta Pi Zeta, but I understand a west coast location was the honored frat. My date, let’s call her Linda, and I went out to the local hamburger joint where the absolute best hamburgers ever were made. Two slices of Texas toast nicely browned, spread with Miracle Whip on one side, saturated with butter, with a slice of tomato, melted cheese, and a flap of lettuce all hugged a large square of beef (this was before Wendy’s). Um! Topped off with a thick vanilla milk shake! Um, um! I’m salivating as I write. Then we exchanged valentines. I can’t remember what mine was. More than likely it was a stuffed bear. For me, stuffed animals were the magic elixir to a girl’s heart. And when you were on a budget, a $5.99 stuffed bear or rabbit was purrrr-fecto! So, I gave her whatever stuffed thing I was able to find at the five-and-dime (a clue as to how many years ago this story happened). She gave me a box, nicely wrapped in heart-shaped wrapping paper. When I opened it, I nearly fell out of our booth where we sat eating. A cake! Homemade, no less! Heart-shaped! With red icing spread over the top and down along the edges. Little red roses adorning the bottom edge. 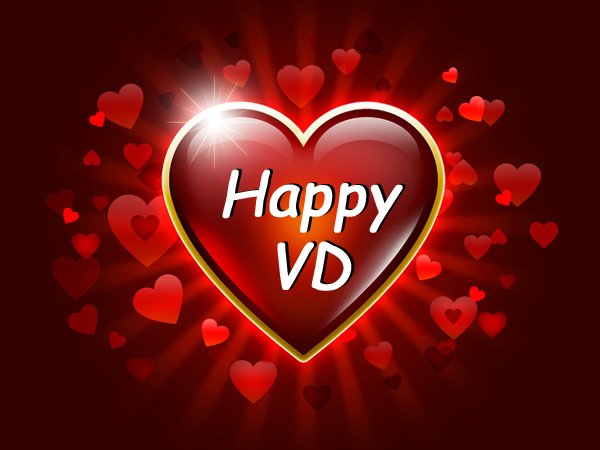 And on the top surface of the heart, the inscription: HAPPY VD! It was written so large, Linda wasn’t able to spell out the words Valentines Day. I guffawed and — had I sipped some Coke before I unwrapped it — would have spewed cola everywhere! Of course I asked her if there was something I should know . . . though we had an innocent relationship. We didn’t eat the cake. I wouldn’t allow it. Instead, I took it back to my dorm room at the end of the evening and hung it on the wall. It dried out over time, and one night crashed to the floor and broke into a hundred little pieces. That is too funny!!!! I love it. Ahhh…it’s that time of year again! A classic! I hope she didn’t break your heart the way the cake eventually crashed and crumbled.